Today we are excited to announce the launch of the Global Forest Watch (GFW), a dynamic online forest monitoring system that brings together near-real-time deforestation data, interactive mapping and analysis tools, and geospatial subscription services to monitor deforestation alerts in areas around the world. We developed GFW as part of a multiyear collaboration of over 40 partners led by World Resources Institute (WRI). We are happy to see this important work released to the public. GFW will allow anyone in the world to visually explore the latest known deforestation activity coming from the worlds best sources. The platform unites data visualization, big data, crowd sourcing, and environmental monitoring, subjects that are all core to the Vizzuality mission. The platform is meant to empower everyone from government policy makers looking for comprehensive on data recent deforestation to indigenous communities who have a stake in the preservation of their local forests. The technology behind GFW is open source with many of the data visualizations, graphs, and maps being powered by CartoDB. Even the temporal visualizations share technology with CartoDB’s Torque library. 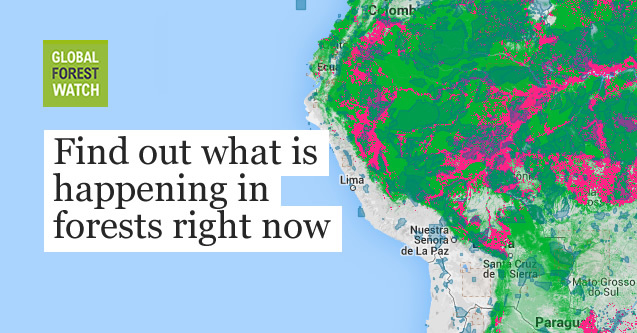 Finding innovative ways to visualize large-scale deforestation data in the browser has been particularly interesting for us and has been a fun area for development that we are proud to now have available now for public use. As part of the GFW project, we worked closely with WRI’s new DataLab. We see the DataLab as an innovative way forward for WRI and a model for other non-profits and foundations to study. The DataLab is bringing together a team of big data thinkers and software engineers with advanced knowledge of global change issues. The DataLab is already allowing WRI to move quickly in areas that are otherwise difficult to enter without these cross-domain thinkers. 6GFW and the DataLab represent a step into the future for global change monitoring. We are grateful for having the opportunity to collaborate on such an important project.